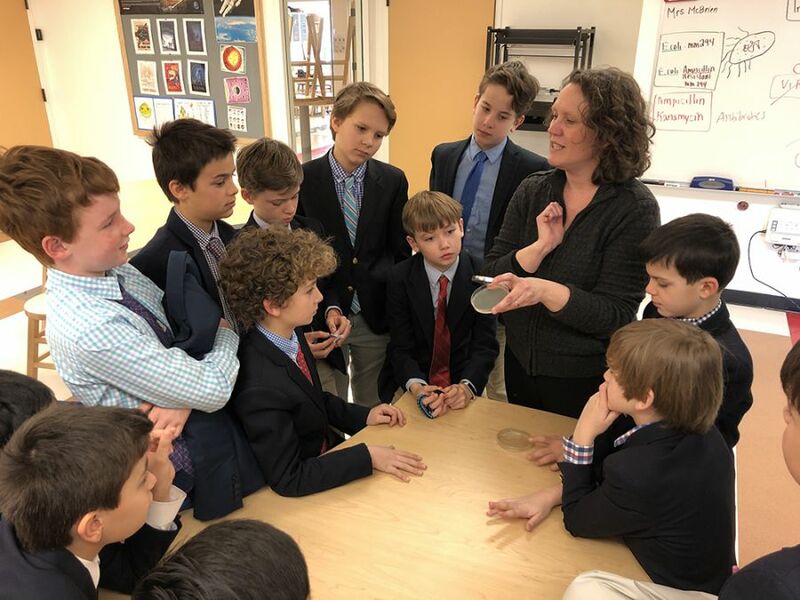 Fifth graders studied bacteria as the last part of their DNA and experimental design unit, conducted through Saint David's partnership with the Cold Spring Harbor DNA Learning Center. The boys first determined which unknown bacteria was resistant to a certain type of drug. They then tested variables to determine effective substances that could kill bacteria. For example, they investigated whether one type of Dial soap was a more effective bacteria killer than another (it wasn't), and whether natural things can kill bacteria (they found some success with ginger and honey, but not oregano.) Each boy enjoyed getting to test something that interested him and seeing what happened. Often the results were surprising and differed from predictions. Second graders enjoyed making and eating arepas and guacamole in Spanish classes, following recipes and identifying the ingredients in Spanish. Third graders are designing, building and testing their miniature race cars for Friday's Nerdy Derby event. Eighth graders visited the Basilica of St. Francis in Assisi on Saturday and are now in Florence.